The TG D71 boundary microphone is primarily used for miking bass drums while placing it simply without any additional mounting material into the bass drum. The non-slip rubber bottom makes sure that the microphone cannot shift by itself. In addition to this the TG D71 can also be used for other low frequency instruments such as cajon, grand piano or upright piano whereas the compact design and the half-cardioid polar pattern ensure easy positioning of the microphone. Due to its high impulse fidelity, a low attack time and a maximum sound pressure level of 148 dB, the TG D71 is suitable for miking percussion instruments. 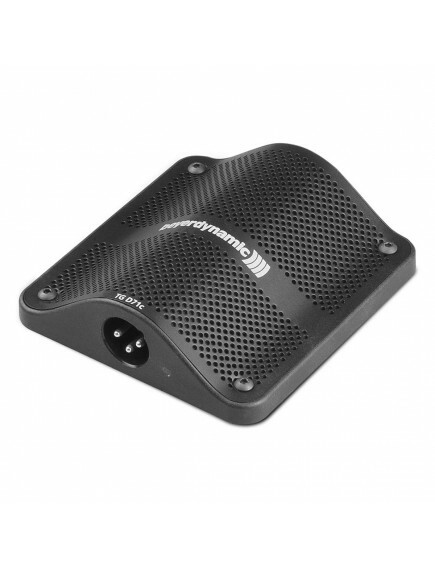 The rugged housing in a slim, compact design protects the microphone against damages in the rough daily use on stage. For a permanent installation on a surface there are two mounting holes at the bottom of the microphone. The microphone is provided with an integrated pre-amp and can be powered on microphone inputs supplying 11 to 52 V phantom power. A red illuminating status LED displays the applied phantom power and in this way the operating status of the microphone. Nominal impedance . . . . . . . . . . . . . < 200 ? Load impedance. . . . . . . . . . . . . . . . ? 1 k?